This time I guided a couple from Switzerland. As she went sightseeing with another guide of Kyoto Free Guide the day before, I showed them around the rest of what they had requested. After picking them up at Hotel Granvia, we headed for Kiyomizu temple, one of MUST=SEEs. Of course the architecture itself is worth seeing, but walking along Nineizaka and Sanneizaka from Kiyomizu temple is also fun. There are many tiny shops. They found some interesting T-shirts at a shop. The pictures on the T-shirts are very popular items seen in TV or magazines coming with a bit different letters. 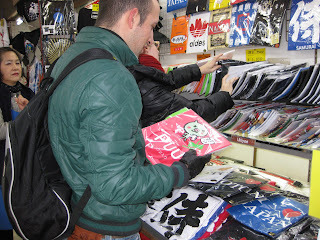 We enjoyed shopping and taking a look at many items sold at each shop. We went to Nanzenji temple. In autumn, we see so many people visiting. However, in winter we met just few sightseers. Though we could not see colored leaves, we fully enjoyed quiet atmosphere in Zen temple.